This month's Love with Food seemed to come a little early, surprise for me! 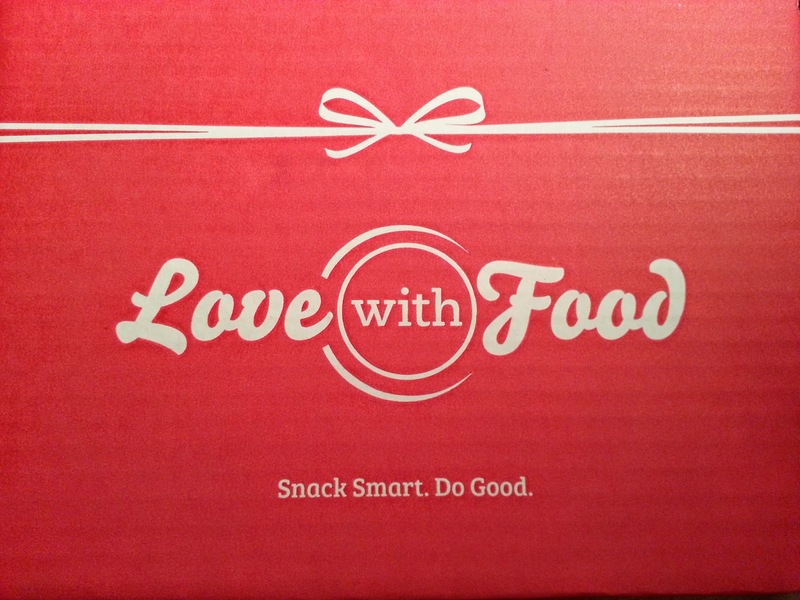 For those that don't know, Love with Food is a monthly food subscription box that has organic or all-natural snacks. There are two sizes, the Tasting Box and the Deluxe Box. 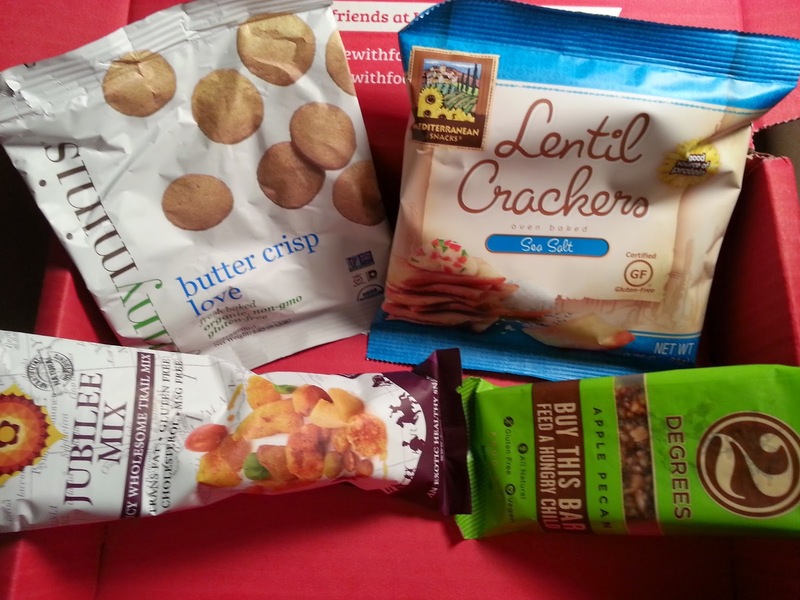 The Tasting Box (which is what I get) has 8+ snacks and donates one meal to hungry kids in America. It is as low as $10/month and free shipping with a yearly subscription (shipping is $2/box without a yearly subscription). 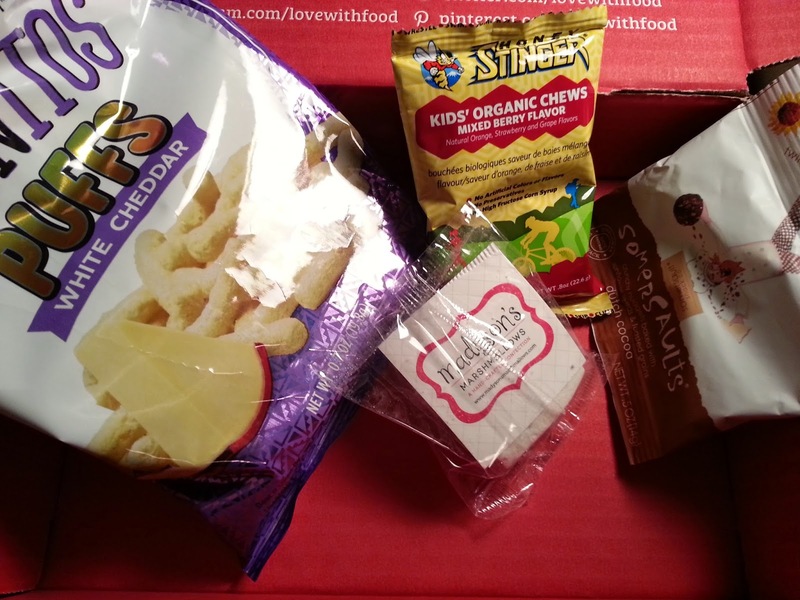 The Deluxe Box has 16-20 snacks and donates two meals to hungry kids in America. It is as low as $17/month with a yearly subscription or $19.95/month if you do it monthly. They have a review program where you get points to use in their store (10 points per item, points for taking boxes, referral program) that is also great. Their store includes items found in boxes as well as other snacks and past boxes at a slightly higher cost than if you had taken that box. Now on to the box! Whoever had the idea to send food through the mail, and food that I'd never heard of before, seriously amazing. 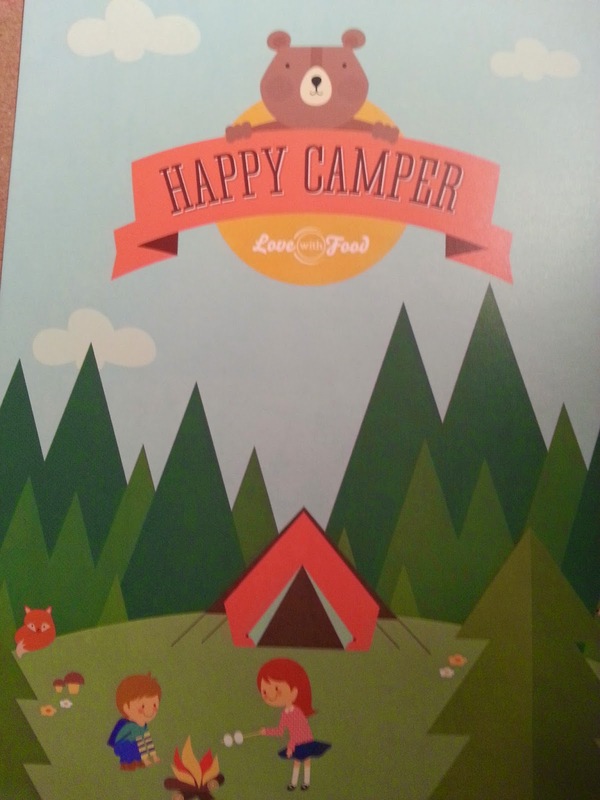 This month's theme is Happy Camper, and is all about food that you could take camping or would want to take camping. Also, they teamed up with 2 Degrees and they're donating two meals to kids in need instead of the regular one. Info card. 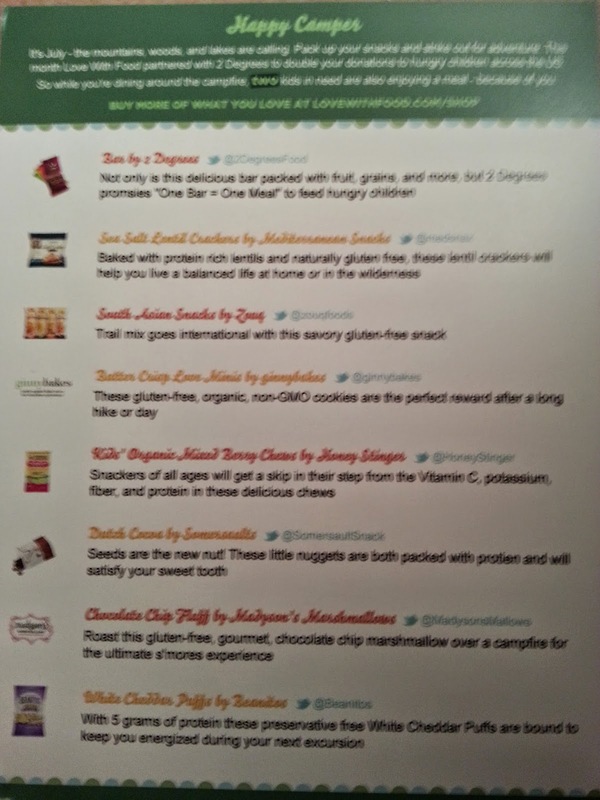 All snacks this month included social media connections, which made things much easier! Jubilee Mix by Zouq ($1.87) - A spicy, wholesome trail mix. Definitely included interesting flavors and was very spicy. Not my favorite thing, but I could see my father eating this. Sea Salt Lentil Crackers by Mediterranean Snacks ($1.89) - I'm not sure if these were supposed to be used with something, but they just tasted like crackers to me. I would probably love these dipped into very unhealthy cheese, but I could see others dipping them in healthier snacks! Apple Pecan Snack Bars by 2 Degrees ($1.25) - The cherry almond one would probably be better, but the apple pecan wasn't terrible. I liked this flavor decently, and I'm interested in the other. White Cheddar Puffs by Beanitos ($1.35) - Big disappointment. I was really hoping these would be comparable to the healthy cheetos you find in stores, but they weren't. Just a bit of a letdown for someone that was addicted to cheetos as a child. Chocolate Chip Square Fluff by Madyson's Marshmallows ($1.56) - It's a marshmallow, but super fancy. It is weird that they are flavored, but it's something I could get used to. I will not get used to the cost of them, though. It was the only true snack in the box that I felt really fit with theme. Kids' Organic Mixed Berry Chews by Honey Stinger ($1.71) - This might be a kid's snack, but I love gummies/chewies. They are definitely not the ones you get at the store, but I could eat these willingly. Dutch Cocoa Somersaults by Somersault Snack Co. ($0.93) - Chocolate!! I thought I was going to die. I need chocolate included in every box and I finally found it. I wasn't expecting nuts and such in my chocolate, but it wasn't bad at all. A great mix of sweet and salty! This month's box was valued at $12.76, so literally just barely over the cost of the box. I didn't find too many snacks that I would buy again, but it did mix up what I was eating for a few days. Did anyone else get this? Thoughts?